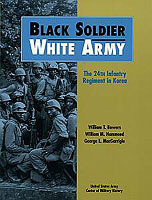 Black Soldier, White Army is a powerful, unvarnished account of the experiences of the African American 24th Infantry regiment, which was stigmatized for its deficiencies while its accomplishments passed largely into oblivion. William T. Bowers, William M. Hammond, and George L. MacGarrigle reveal that the 24th suffered from a virulent racial prejudice that ate incessantly at the bonds of unit cohesion and that hindered the emergence of effective leadership. The story takes its place in a growing body of literature that details the service of African Americans to their nation. It offers profound lessons for study and reflection by unit leaders in today's Army.